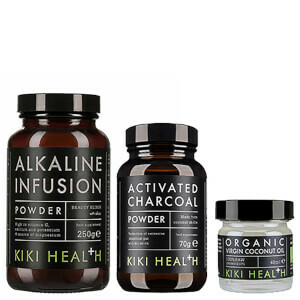 Restore radiance from top to toe with the KIKI Health Beauty Essentials Bundle, a set of three bestselling products to improve the overall health of skin, teeth, hair, nails and the digestive system. Each supplement works perfectly alongside a healthy diet to promote a strong body and a glowing appearance. Suitable for vegetarians and vegans. Free from gluten and wheat. Cold-pressed from fresh coconuts that have been harvested from organic plantations in Sri Lanka, the pure and unrefined coconut oil is a multi-tasking product that can be used for baking, cooking and skincare. A healthy replacement for oils and butters, it can be used to fry your favourite foods or as a lighter substitution in baking. 100% pure and organic, it can also be used to treat your skin and hair; use it as a face mask or moisturiser, and to soften your hair or deodorise your skin. Purified through simple filtration and centrifugation, the virgin coconut oil delivers multiple health benefits. A multi-tasking, pharmaceutical grade supplement that can be taken orally to help naturally whiten teeth or detoxify the digestive system; or used as a skincare component to absorb excess toxins. 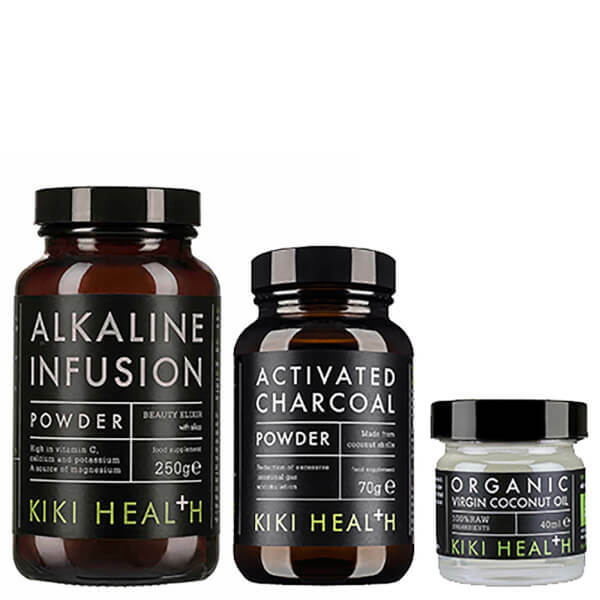 Sustainably derived from Coconut Shells hat have been finely milled, the odourless Activated Charcoal Powder has been intensively purified to remove any contaminants for use as an active cosmetic ingredient. It acts as a natural solution to absorb unwanted substances; when used to brush teeth, it minimises the appearance of yellow tones and stains, and when taken mixed with water it helps alleviate symptoms of bloating and flatulence after eating. Coconut Oil: KIKI’s Coconut Oil can be used safely in cooking and retains a pleasant aroma and still retains a delightful coconut flavour. Can also be used as an effective beauty aid; massage oil, lip moisturiser, hair mask, eye cream, eye make-up remover and highlighter. Charcoal Powder: 1 level teaspoon dispersed in a glass of water, taken by mouth immediately. Rinse with water to remove any residue. For teeth, put a small amount of powder into the palm of your hand. Wet toothbrush and dip into powder. Gently brush for 2 minutes. Brush again with water or toothpaste to remove residue. Not recommended for children under 12. Coconut Oil: 100% pure unrefined certified organic cold pressed virgin coconut oil. Charcoal Powder: 100% Activated Charcoal (The British Pharmaceutical Codex) BPC 1934.